Having a new restaurant website is little like having a brand new restaurant. It might be amazing, but no one will know about it if you don’t market it properly. It all starts with Google. After all, if your website can’t be found on Google what’s the point in having it at all. The good news is, getting your restaurant set up in the Google universe is actually reasonably straightforward. 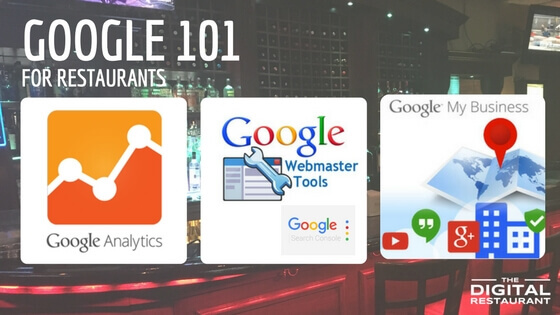 There are three Google features that every restaurant should be taking advantage of straight away: Analytics, the Search Console, and Google My Business. Ready to get your Google on? Then let’s begin. The first thing every website owner should do regardless of whether they are going to optimize for search engines or not is to create a Google account and implement Google Analytics. With Google Analytics, you can see how many people visit your website, where they are coming from and where they are based. You can also see what device they are using, what pages they visit and how long they stay on the site for. Start by opening the Google Analytics homepage and creating a Google Account if you haven’t already. You can use this to access all of the tools we will discuss in this post. Once you have created or signed into your Google account, it only takes a couple of steps to get started with Google Analytics. Start by signing up for Google Analytics. Fill out all of the information and accept Google’s T’s & C’s to get your tracking ID. You will need to paste this tracking code into the header of your website. If you used a web design agency to create your site, they would be able to do this for you. If you did it yourself using WordPress, there are several free plugins that let you add the tracking code to your website easily. Once you have added the tracking code to your website, log back into analytics and check that it is tracking properly. Where visitors are based – maybe you need to expand your delivery? What devices visitors use – do you need to create a mobile app? What pages are they visiting the most – do you need to make your specials pages clearer? At the very least, Google Analytics will be important if you carry out any restaurant marketing strategies to see if the number of visitors to your site increased. Once you have Analytics set up, the next step is to sign up for Search Console. Google’s Search Console lets you have greater control over the way that your website appears in search engines. It is crucial if you want to optimize to appear higher in relevant searches. So let’s get started. Simply add your website’s address in the box and hit add property. Upload the verification file to your website or use your Google Analytics account to verify ownership. What can you do with the Search Console? Once you know what people are searching to find you, you can start optimizing your website to attract even more customers. There’s a lot more to Google than just analytics. One of the most valuable tools for restaurant owners is the ability to list their restaurant on Google My Business. 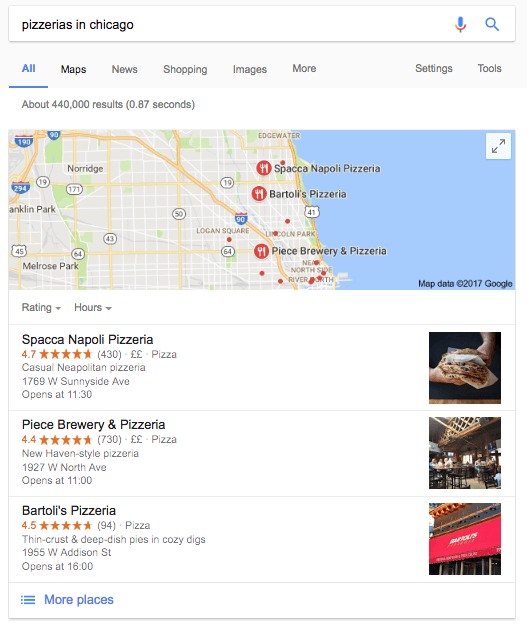 This makes it possible for your restaurant to appear in the map results that are presented when someone searches for “restaurants in Chicago” or “pizzerias near me”. If you haven’t already, this should top your to-do list. Click on the green START NOW button to sign your business up. Google will send a postcard to your address to verify that you operate out of the premises that you listed. This can take up to two weeks and there will be instructions on the postcard to complete the verification process. Once you have verified your account, make sure you fill out your Google My Business page by adding high-quality photos, adding your opening hours, creating a description of your restaurant and encouraging visitors to review you. Once you have fully completed your Google My Business profile, your restaurant should start appearing in relevant local searches like the one below. Google My Business is a fantastic way to attract local customers who are actively searching for your kind of restaurant. Just remember to get as many good reviews as possible! Once you’ve got Analytics, Search Console and Google My Business set up, you’ll probably want to really take advantage of everything that Google has to offer. SEO (search engine optimization) and PPC (pay per click) marketing campaigns are the next logical step. These aren’t things that should be attempted without prior experience, however. If you want to improve your rankings dramatically, speak to a digital marketing agency that specializes in SEO for restaurants and PPC for restaurants. For more information on advanced Google strategies, or for help setting up Analytics, Search Console or Google My Business, get in touch today.